It is the time of year moms have tears in their eyes as they watch their children complete one more year of school! Some are tears of joy, some are tears of “oh no… I must get summer camp registrations done ASAP”. Most kids have been doing the countdown for the last 2 weeks already! Summer means no wake up time, no homework, and no projects. They focus on fun in the sun, camps and new friendships. Summer camps are great for kids to get involved in new sports or activities and making memories that last a lifetime. 3-4 ounces of lean protein: chicken, turkey, tuna fish, turkey jerky, hard boil egg. Plant based protein and healthy oils: handful of nuts, 2 tablespoons of Nut Butters, beans and chickpea hummus (made with olive oil). Fruits: 1 cup of grapes, mandarin oranges, pears, apples, berries, watermelon. Vegetables: ½ cup broccoli, tomatoes, celery, spinach, cauliflower, baby carrots. Calcium boost: Yogurt, 1-2 ounces of cheese, milk, fortified almond, soy milk. Whole Grain: Quinoa, brown rice, whole wheat bread, tortillas, crackers, bagels, pasta. Hydration: Water or coconut water. Following this list will help you build up a variation of lunches to last a whole summer! Variety is key to ensure your kids will get a wide range of vitamins and minerals. Try to alternate different fruits and vegetables as much as you can. Use it for planning your grocery shopping lists too. Have key ingredients you can rotate and put together different sandwiches, wraps, dips, kabobs and other fun ideas that will keep your child nourished and ready to enjoy camp all summer long. It’s almost as controversial as chocolate versus vanilla, more scandalous than hot versus cold, and much more interesting than fat free versus whole fat debates. People have opinions, and they all must be heard! I’m not entirely qualified to write about this dilemma, as I was only introduced to peanut butter at the age of 16! Yes, my parents deprived me of such delectable food until my mid teenage years. In their defense, I was raised in South America, Brazil specifically, where peanuts are abundant, but no one ever thought of making butter out of them. They did however add them to the food processor with sugar, amongst other ingredients, to make “paçoca”. If you are a proud member of the “peanut gallery” (ha! Pun intended) add that food to your list of “must-try-before-I-die” because it is simply divine! However, I will proceed by first looking at the question of nutrition, since after all, that is something I am qualified to talk about. Looking at the numbers, crunchy peanut butter has the slight edge since it has a tiny bit more fiber, folate and less saturated fat than smooth. But in the end, both kinds are winners because that they are a great source of plant based protein, have lots of vitamin E, and they are an awesome source of B vitamins, as well. So whichever side of this debate you are in, rest assured you have already made a great choice! Now in terms of practicality, I am a working mother . I have two kids under the age of 6. I have to pack lunches, make snacks, and often prepare last minute party requests. I believe I am also a qualified observer. The smooth just works better. Now, no offense to you crunchy-siders, but how do you get it to spread it on a soft slice of whole grain bread without ripping it to shreds? Or better yet, how do you get it to blend it so effortlessly into a yogurt parfait, or smoothie for a quick breakfast favorite? So there you go this one goes to the creamy peanut butter fans. … life is short, laugh out loud! Most of us go grocery shopping at least once a week, and usually, as we wander through the aisles, we focus on nutrition labels and the ingredients of the products we pick up. Every once in a while, I am lucky to go to the store all by myself (yep, when you have kids even a trip to the grocery store alone seems like a mini- vacation). That’s when I do most of my research. I take my time reading labels and looking for new products to try. I add new recipes to enhance my list of basic meals to get us through our many busy weeks! But how often do we stop to think about how those products arrived on the shelves of our grocery stores? How many people did it take to get the products there? How far did they have to travel? For example, how many lives were impacted during the production of that single jar of honey or fresh coffee you can’t live without? Injustice is an unfortunate certainty of our times. The age of technology and industrialization has left this generation often disconnected from the behind- the- scenes realities of food production. Most of us know that honey comes from bees — and yes, not all know this basic fact — but only a few know how honey is harvested. Few know where the bees collect their honey, or how many people it takes to bottle it. In short, not many comprehend how the honey makes it from the hives into the neatly packaged bottles on grocery store shelves. All people involved in the process are crucial in making sure we have a quality product to enjoy at our convenience, and for that, we are so very thankful. Likewise, we assume those involved in production are all being treated fairly and with ultimate equanimity. I’m sorry to reveal that this simply isn’t always true. Often, growers, small-scale farmers, international workers, and members of isolated communities endure unfair work conditions so that we can benefit from the goods they produce. The study of nutrition has taught me so much about the human body, and it has also highlighted my personal sense of our collective connection to this Earth. We have a profound social responsibility to treat this Earth — and each other– with respect and kindness; therefore, when I have the choice of purchasing a product that bears the Fair Trade seal, I consider this, a win-win situation. I know I’m getting the best product, and I can feel good about it! The next time you go grocery shopping, look for the Fair Trade seal: teach your kids about it, and feel good about giving importance to a practice that will ensure a better tomorrow, starting today. 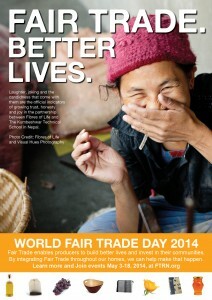 May 10th was World Fair Trade Day, with worldwide events taking place during a full week of awareness celebration. To learn more about Fair Trade, visit the website: http://www.ftrn.org/ . 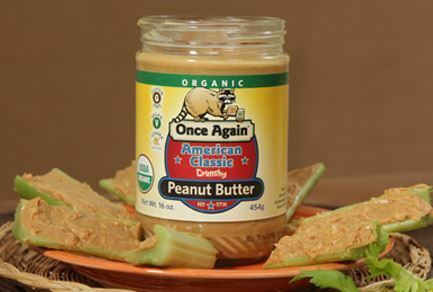 Once Again Nut Butters is the nut butter that “spreads integrity,” and is a major sponsor of WFTD this year! … be good, do good, feel good!